X-LAarge Vertical Round Steel Tank-1pc. 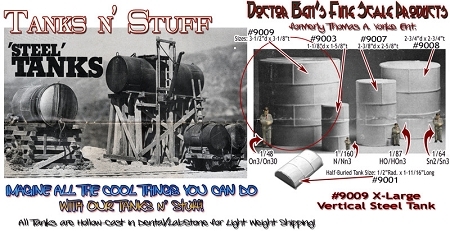 The sizes/dimensions for all Tanks are shown in the image above right. Also shown in the image are four scale figures in O, S, HO & N scale for you to view the figure's proportion to the Tanks. Click on the image to enlarge the image in your browser. 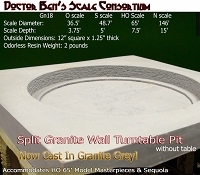 We have "Hollow-Cast" the Medium, & Larger tanks to save material and shipping costs. EXAMPLE: The 1980s version of the #9009 X-Large Vertical Steel Tank weighs 1 pound, 7 ounces. Our same casting weighs 7.2 ounces! In fact, all seven of the tanks in the *SPECIAL* weigh less that the 'original 1980's' X-Large Tank casting. Bases for these Tanks are not yet available for this miniature Tank Farm, but that shouldn't stop you from creating you own bases using Doctor Ben's Baby Building Blocs. Add a 2-Pounder to this order and save yourself some shipping costs by letting us combine your purchases into a single shipment today!